10ml Plactic Bottle. Concentrated Aroma recipes must be diluted in the base. Do no vape directly the aroma. Concentrated recipes with complex flavours from the range Crazy Up ! 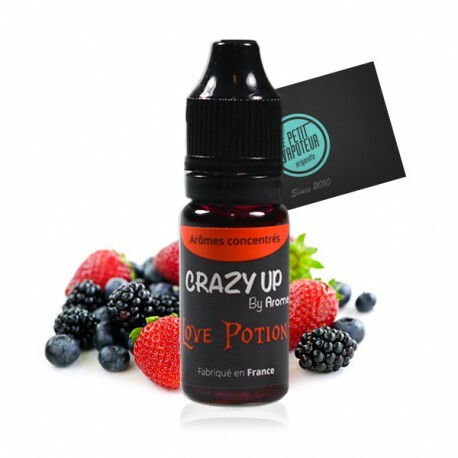 Concentrated Aromas by Crazy Up are ready to use for preparing your DIY e-liquids. Aroma must be diluted in the neutral base. The aromas Crazy Up for your e-liquids are made in France by the label Aromea. Advised Dosing: Between 10% and 20% of the aroma Aromea to be diluted in the neutral base. Base 30 PG / 70VG: 15% or 45 drops for 10ml of base. Base 100 VG: 20% or 60 drops for 10 ml of base. 10 ml plastic bottle with a rotating ring, child security, visually impaired triangle on the cap, composition, DLUO, Lot number. Un bon produit mais qui pour ma part pourrais avoir un goût plus prononcé, sucré. Néanmoins il est très bon il peut être combiné avec des additifs pour devenir excellent.